Peaches, the summer fruit that we live for in Missouri, especially if the peaches are from Calhoun County (IL). Good stuff! This peach cocktail is lovely. Refreshing and a bit sweet. Perfect for a pre-dinner cocktail or a sitting on the porch cocktail. Enjoy it wherever you want! This drink has a nice woodsy taste from the rosemary, sweetness from the peaches and the right amount of kick from the gin. I'm not a gin drinker and I liked this drink! I'm joining a group of bloggers who like to improv each month using a special ingredient. This month, of course, is peaches. If you wish to join up, click here and make a request! In a cocktail shaker, muddle peach, rosemary and simple syrup. Add gin, juice, Campari and ice. Shake until cold about 15 seconds. Fill highball glass with Sonic ice. Strain drink into glass. Top with club soda. Garnish with rosemary. Participating in Thoughts of Home #25. Looks amazing! I'd love to have one of these today! Sonic ice! -- That's even better than cream (and a lot less fat!) Was not expecting the rosemary, but maybe I'll try it with my purple basil. (Oooooh -- I also have a lemon thyme in my garden that might work...) Thanks for the recipe, Terri! This cocktail sounds so refreshing and perfect for a summer night out on our patio!! Pinning! Yassss, booze. I would totally add a splash of cream though - like an Italian cream soda. I have always loved peaches, but I don't believe I have tried them in a cocktail before. Thanks for sharing this recipe! That looks amazing! I love peaches so much, but I'm not sure I've ever tried it in a drink. This would probably be a delicious blended ice cream drink as well.....and there's the cream. Looks so beautiful. I am obsessed with Rosemary lately so this is right up my alley. This drink looks so delicious. I added it to my Yumprint library so I can try out it soon. oh my god, you did an amazing job with these. I just want to take one right off the screen and drink it. I cannot believe I've never had a peach navy fizz before! How does that happen? Putting this on the list for the next girls night in a few weeks, yum! OH I love how delicious this sounds!!!! I never had Campari before though, I will have to pick it up when I go to the store next to make this! Ohhhhhh, this looks SO tasty! I love peachy flavored things. Perfect for summer, that's for sure! Yum! Looks absolutely delicious! I love summery drinks. Refreshing! That looks very good. I love peaches in recipes. They are so fresh and always remind me of summer. I bet this peachy drink is very refreshing in the summertime. 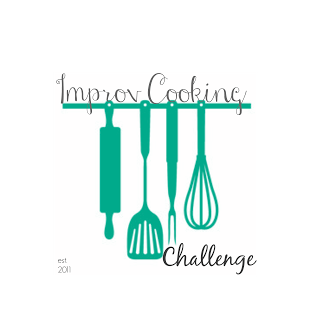 I think that the Improv Challenge is also very cool - looks like a lot of fun to participate in. That sounds refreshing, and peaches are just starting to ripen up here. This drink looks so good and refreshing. Peaches are one of my favorite fruits! Gorgeous and they sound so refreshing! YUM! I love Gin and this would be perfect for a girl get together. I love Malibu so this would porbably work great with this cocktail. What a yummy drink. It sounds like the perfect way to end a hard day.